Here’s a chance to indulge in some sweetness - at a reduced price! These were a HUGE hit at our last Chocolate show, and this is your chance to share the sweetness! Get ready to indulge and tease your senses! You'll want to take a bite - but dont! Our new Chocolate-Covered Marshmallow soap will amaze you. We've taken two of our amazingly-realistic, large marshmallow soaps and generously coated them with all things decadent! Hand-dipped in layers of chocolate soap. Candy sprinkles are added for that extra touch of sweetness. You will wish they were real! Scented with our Chocolate Marshmallow oil. 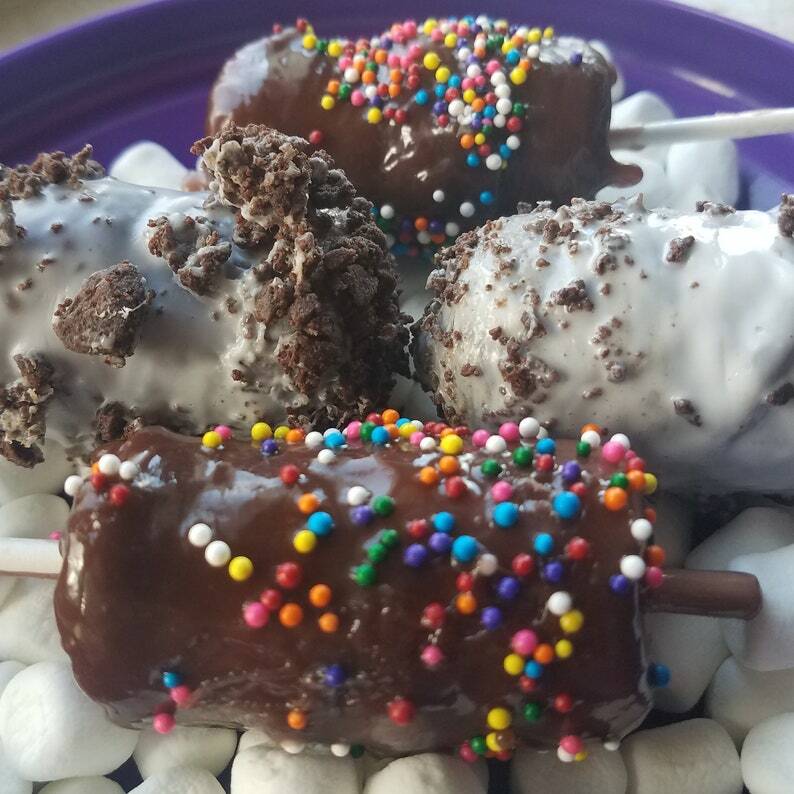 You'll receive 1 randomly-selected chocolate covered marshmallow soap with sprinkles on a popsicle stick. Deliciously sinful and fun! Perfect for party favors and gifts - and we always combine shipping on multiple purchases. And because these are custom made to order, they're easily customized to match your color themes. We always combine shipping on multiple orders,so take advantage and stock up! My friend actually thought these were doughnuts; she texted me after opening (one of a few gifts I'd sent her), when she actually poured herself a glass of milk and sat down with them! Authentic to the extreme! Thank you so much for accommodating my special order! I love the sweet potato fries!! Payment is appreciated at time of order, however for custom orders, arrangements can be made to pay prior to shipping. We do not participate in vendor to vendor trades - please see our notation in our Welcome section. Unfortunately, bath and body products are unable to be returned; Please contact us with any questions prior to purchase. If there should be an issue with an order, please contact us and we will do our best to resolve your issue. We gladly ship our quality products internationally - contact us prior to ordering for specific pricing rates for your country. International pricing will cover First Class International Shipping with no insurance or tracking. International customers are responsible for paying for any customs fees due for their country. Any packages returned to AJSweetSoap for non-payment of customs fees will not be refunded or reshipped. For most items shipped within the US, Priority 2-3 shipping is recommended and used as the standard method of shipping, and shipping charges are combined for multiple purchases. Overages are refunded back to the customer via their selected method of payment. We recommend purchasing insurance for an additional fee; if you do not specify insurance, we are not responsible for any item once it is shipped. Although we take pride in how quickly we will create your purchases and ready them for shipping, we have no control over the US Postal Service once the package is picked up. Please allow adequate time for shipping if you're purchasing a gift or it is needed for a specific time. When shipping the item, we will ship to the address listed on your PayPal receipt. If this is not your current address, please let us know in the message area when placing your order so we'll know to ship elsewhere. Most importantly, enjoy your Guiltless Indulgence! At AJSweetSoap, we appreciate your business - thanks for looking at our shop!